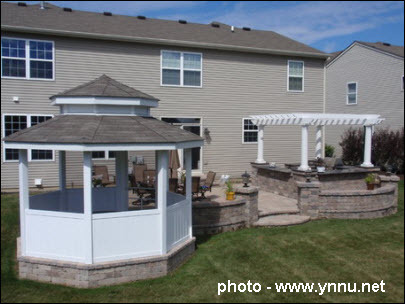 The gazebo – a perfect Minnesota outdoor room. Do you already own a gazebo or perhaps you’re thinking of owning one but you want to make sure that you’re going to get the most out of it? One of the biggest reasons to have a gazebo is because they are versatile. They give you that ability to sit out back and enjoy the weather and the sights. Here are some tips and ideas to make the most of this versatile outdoor room. Once a luxury for many homeowners, gazebos are popping up in Minneapolis area backyard these days. What’s unfortunate is that some owners but do not actually use them much, and some of them might not even know what to use them for. Others find they almost live in them during the warm months. The gazebo becomes an extension to their home for those that do use them. If you’ve got small children, you can turn it into an outdoor playroom. The kids are able to hang out in it like an outdoor room and play inside out of the sun. It’s a great spot for a small sandbox. Consider adding screens and lighting, and you’ve got a spot that you can use day or night – imagine enjoying the great Minnesota outdoors without the mosquitos and flies! Some gazebo owners have even added electric service, which further expands the possibilities. Think about an outdoor media center – add a stereo, a TV, and some comfy furniture and you’ve got an outdoor family room. Another good use for a gazebo would be placing a hot tub inside it. You can then enjoy the outdoors while inside the hot tub and under the shade of gazebo. You can add lattice or gauzy drapes if you would like some privacy while inside the gazebo. Gazebos also work well as poolside shelters. If you do not want to build a new pool house, choose to use a gazebo to house items and lounging furniture. You can even add windows and doors to turn it into a cabana. If you work out at home, consider moving your exercise equipment outdoors. Put down your yoga mat and enjoy nature while you relax. Don’t forget the inside the gazebo when it comes to your plants – add containers, flower boxes, vining plants, and landscaping alongside your gazebo to enjoy on these days when you’re out there in the beautiful weather and want something to look at. This is a structure that is made for entertaining. Bring your family out and enjoy dinner or invite friends and family over to eat and enjoy the outdoors while in your gazebo. Drinks are the best when they are enjoyed outdoors with people you love. And if your gazebo is large enough, it could be the perfect spot for an outdoor kitchen. Gazebos are incredibly flexible outdoor structures – you have so many options to customize it for your lifestyle. Use it as a home office or get married in it – the choice is yours. And many of these suggestions we’ve provided aren’t permanent, so you can change things up as your needs change. Architectural Landscape Design is a Minneapolis MN landscape contractor that specializes in outdoor rooms, including roofed structures such as pergolas and gazebos. If adding more enjoyment to your yard this spring sounds good to you, call us today for a free consultation. (952) 292-7717.